This is "archival" information. Click here to go to the new page. 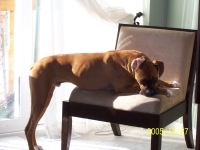 Lost Sammie - a happy ending! Piano Lessons anyone? Here in Cumberland Village! All stories are "By Patrick Meikle", unless otherwise noted. We just received a phone call from a representative of BBM Canada, also known as the Broadcast Bureau of Measurement. It was from number 1-514-908-2492. They are doing a preliminary telephone call to residents of the Cumberland area (833-), to ask them if they would be willing to participate in a survey to see what radio stations they listen to. The calls are legitimate, but because some people are not familiar with the BBM, they think the callers may be telemarketers or scam artists trying to get personal information. Don't worry, if the telephone number shows up on your call display, it really is O.K. Read what some people have said about the BBM - Warning: some language may offend. BBM will first ask if you are over 18 and if you are a resident of home. If you are willing to do the survey, BBM will then ask you for the names of all persons over the age of 12, along with your home address, so they may send you the survey booklet tht will arrive by Canada Post within "two weeks". You can also find out more by going to Wikipedia, click here. (Courtesy the Orléans Star) The annual Cumberland Winterfest runs Feb. 12-14, starting with a Euchre tournament on the first day and culminating with Olympic-inspired activities at the Cumberland Heritage Village Museum on Sunday. Saturday’s list of events will kick off with the annual Lion’s Club Breakfast at Maple Hall from 8 a.m. to noon. Those interested in curling, especially with the Olympics starting, can try the sport for free at the Cumberland Curling Club. There’ll also be a dinner, dance and silent auction Saturday night at the R.J. Kennedy Centre, with proceeds going to local charities and the Haiti relief efforts. Cumberland Village Community Association president Rebecca Dufton said this is the community’s major fundraiser. Money collected will go to the Orléans food bank and Cumberland Community Resource Centre. This year, however, a third recipient will benefit from donations. A third of the funds raised will go to Haiti relief efforts, Dufton said. "I am deeply gratefull to everyone in the neighbourhood on and surrounding Kinsella. So many people voluntarily participated in the search for my dog Sammie. 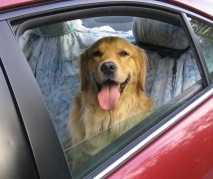 Everything from calling my cell phone whenever they spotted him to walking, biking, and driving around looking for him! A few people even told me to jump in their cars to drive me to where the had just seen him! I am truly amazed and so thankfull for all the help! Take a bow Cumberland Village! Join the fun in what will be the “show of the year” at this year’s Heritage Power and Country Festival on May 30 and 31. 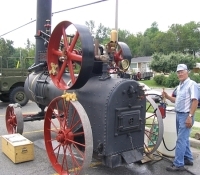 The two-day event features antique gas- and steam-powered engines, model train demonstrations and vintage cars, as well as live music and diverse children’s activities. This is a great community event supported by volunteers and local businesses. On Saturday, enjoy musical performances by the Ottawa Police Service Pipe Band, Chris Rouffer, the Lyon Street Celtic Band, and other jazz, folk, gospel, and classic rock music. Be sure to catch the Capital Horse Pull competition, the festival’s highlight event. 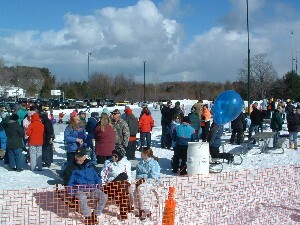 Sunday features more live music, an Ottawa Police canine demonstration, Grass Hogs lawn tractor racing, and much more. For the complete listing of events and information, click here. Dr. John and Mrs. Simone Joanisse of Cumberland Village are participating in the June 5 Weekend to End Breast Cancer by walking 60 km and raising at least $4,000. for the Ottawa-Carleton Cancer Foundation. If anyone would like to make a donation to their walk, you can find their personal pages on the website www.endcancer.ca. They are: John Joanisse or Simone Joanisse. You can also contact Simone at: 613-833-1467. Please help them in this worthy cause. Residents are invited to come out and participate in a public consultation relating to the development of the Cumberland Heritage Museum. The City of Ottawa is planning for the years from 2010 to 2020. Thursday, May 7, 2009 Time: 7 to 9 p.m. R.J. Kennedy Community Centre 1115 Dunning Road, Cumberland. For more information, contact: Jim Mountain, Cultural Planner, at 613-580-2424, ext. 23914 or e-mail at jim.mountain[at]ottawa.ca. A retired police officer has volunteered to represent our community. If you have any police issues to be addressed, please forward them to Tamara Belle-Isle prior to May 11. rbelleisle[at]rogers.com. and Frank Kenny Road and as far as Wilhaven Road. Please note that the Canaan Connexion now has theCumberland Lions Club news on a separate web page. Click here. familiar people and places are featured. $10. The market is now closed for the 2008 season., the market was held every Saturday, from 8:00 a.m. to 1:30 p.m. - from June 21st until October 11th. For more information and next year's openings, visit their Web site. For some past history, see last year's story. Click here. 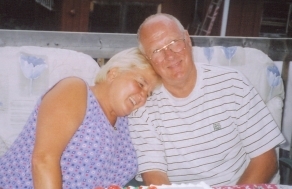 On Saturday May 10 John and Martine (Marty) Williams, long-time residents of Cumberland Village, true pillars in their community, were special guests at a benefit dance in their honour and you can still offer your support. John and I would like to express our gratitude to all our friends who participated in our benefit dance and offered their support though gifts and donations. So many people gave up their time to prepare the lunch, work at the bar and prepare the hall. It is difficult to reach every one but we sure want them to know that we thank them from the bottom of our hearts. 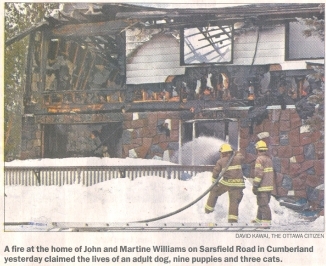 In the tragic blaze, John lost his favourite Golden Retriever, Magivor and MARTY lost a litter of nine puppies as well as her three loving cats. John and MARTY have been pillars in our community all their lives and have always willingly and voluntarily responded to the needs and services of others in our midst. In recognition of their contributions, the Cumberland Lions Club would like to assist John and Marty in part to rebuild their home and lift their spirits. All family, friends, neighbours, steam engine enthusiasts, antique buffs and customers are cordially invited to join us to make this gathering an unprecedented success. Donations to the John and Marty Fund will also be accepted by Dan at the John Deere Parts Counter at J .A. Williams Sales, 1490 Dunning Road, Cumberland or mailed directly to P.O. 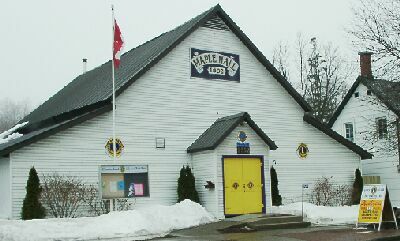 Box 83, Cumberland, ON K4C IK9. Since all the contents of the house were destroyed, along with 40 years of memories, anyone having old pictures, scrap books or other memorabilia pertaining to John & Marty are encouraged to share them. In keeping with John & Marty's spirit of giving, a portion of the proceeds will be donated to the Ottawa Humane Society. Let's make new memories on Saturday, May 10,2008. Reverend Father James Whalen, pastor of Saint Margaret Mary Parish in Cumberland, Ontario, died suddenly of a heart attack on Sunday, February 24, 2008 at the age of 68. He was conducting a pro-life parish mission in Thorold, Ontario, and collapsed shortly after giving a seminar. Father Whelan was the National Director of Priests for Life Canada. He was suggested for the position by Archbishop Marcel Gervais of Ottawa, who had received the Priests for Life information package. Father Jim agreed and it was agreed that it would be difficult to think of anyone more suited. Father Jim was not new to the pro-life movement. In 1991, he was designated as pro-life researcher and analyst for the Archdiocese of Ottawa. Prior to becoming a priest (1972), he taught in the separate school system for eight years. He holds a doctorate of philosophy degree in formation spirituality and he taught religious science at the Ottawa University. As well as being the pastor of St. Margaret Mary bilingual parish in Cumberland, Ontario, Father Jim was Spiritual Director of the Legion of Mary Senatus in Northern Ontario. We had a saying long ago in one of our religious houses in Ireland: "If you want a job done well, ask the busiest man in the house to do it." We seemed to have applied the same principle here. When asked if he was willing to take, on the challenge as National Director of Priests for Life, Father Jim replied, "As priests, we cannot not be involved." WHALEN, Reverend Father James On Sunday, February 24, 2008 the age of 68, Fr. Jim Whalen, National Director of Priests for Life Canada and son of the late James and Rita (Leblanc) Whalen, passed away while conducting a pro-life parish mission in Thorold, ON. Father Jim has been pastor of Saint Margaret Mary Parish in Cumberland, ON since 1992 and has been a priest with the Ottawa Archdiocese since his ordination in 1972. He also served as the spiritual director of the Legion of Mary Senatus and the Ottawa area Catholic Home Schooler's Association. Fr. Jim spent thirty years assisting the native people of Canada as chaplain for Native Peoples of Ottawa and founded the Odawa Native Friendship Center. He will always be remembered as a strong advocate for the unborn who believed strongly in building a culture of life and a civilization of love, truth, and justice. Fr. Jim is survived by his three sisters: Isabelle Patry, Montreal QC, Joanne Taylor, North Bay ON, and Patricia Whalen, North Bay ON. 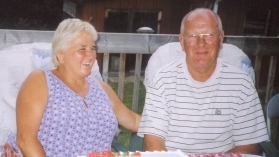 Visitation will be held from 9:00 am to 4:00 pm, and 6:30 pm to 10 pm on Thursday, February 28, 2008 at St. Margaret Mary Church, 2565 Highway 174, Cumberland, ON. 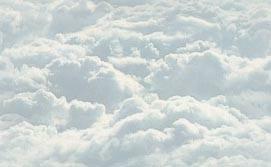 The funeral mass will be celebrated at 10:00 am on Friday, February 29, 2008 at Divine Infant Church, 6658 Bilberry Drive, Orleans, ON. Interment to follow at Hope Cemetery, Ottawa. STATEN ISLAND, NY, Feb. 25 /Christian Newswire/ -- Fr. Frank Pavone, National Director of Priests for Life, commented today on the passing of Fr. Jim Whalen, National Director of Priests for Life Canada, who died suddenly Sunday while conducting a pro-life Parrish Mission in Thorold, Ontario. "All who are building the Culture of Life have lost a great leader and friend in Fr. Jim Whalen," said Fr. Pavone. "Fr. Jim understood that contraception, abortion, and euthanasia are enemies of the human family, and he fought these evils with truth and compassion. Fr. Whalen played a key role in starting the international growth of Priests for Life. We look forward to continuing to work with our Canadian brothers and sisters." 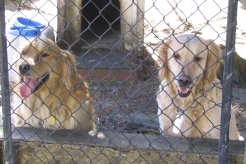 They are breeders of golden retriever dogs and one of their older dogs, plus nine new puppies and three family cats died. Fortunately not all of the adult dogs were in the house at the time and they could bem seen on the evening television news, romping around the yard as the firefighters were mopping up the site. John Williams had been away from his Cumberland home for two hours when a neighbour came rushing into his Williams John Deere tractor store to tell him his house was on fire. He rushed to his nearby home where he found the two-storey structure engulfed in flames. His wife, Martine -- who had arrived minutes earlier -- was suffering from smoke inhalation and only a few of their animals had escaped the inferno. "It's disbelief," he said, "They were like people." By mid-afternoon, the fire was under control, but Mr. Williams could only stand nearby watching firefighters dig through the charred skeleton of the home he built nearly 40 years ago. Ottawa Fire Services said the fire started in the couple's kitchen, but the exact cause has yet to be determined and is under investigation. Mr. Williams said his wife had tried desperately to extinguish the blaze when she first came home at around noon, but her efforts proved futile and she retreated. Firefighters arrived at about 12:30 p.m. after a neighbour called in the fire. Between 60 and 70 firefighters were needed to douse the flames, said sector Chief Paul Hutt. "The fire consumed the house," said Chief Hutt. "By the time the crews arrived, there was fire coming out of all the windows." Damage to the home is estimated to be $350,000. Mr. Williams said he doesn't know what could have started the fire because the couple turned off all their appliances before they left home about 10 a.m. Throughout the afternoon, a visibly shaken Mr. Williams could be seen patrolling his yard, palms blackened by ashes, looking to help firefighters pick precious items out of the gutted home. Carol Kennedy, who lives nearby, said the Williams family are great neighbours. "They've always worked hard. 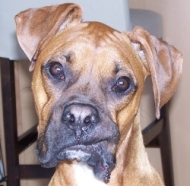 I know [Martine] loved her animals a lot, so I know she will feel devastated," Kennedy said. While Mr. Williams was quick to admit the loss was very hard for his family, he did manage to stay positive. "You hear about people getting out with just the clothes on their back," he said pointing to his shirt and pants while letting out a chuckle. "Well, I'm wearing them." Just prior to this call, firefighters were called to a blaze at 322 Reynolds Drive, near St Georges Street. It was put under control but paramedics treated one patient for minor smoke inhalation. The Cumberland Lions celebrated 40 years during their charter night on Jan. 18. Over 100 people joined the celebration, including 16 members and visiting Lions from 12 area clubs. Don MacDonald, the only active charter member, chaired the event. Ron Walker was presented with the Melvin Jones Award, the highest award given in Lionism, for his outstanding service with the Lions and also the community. Derek Tilly received the Helen Keller Fellowship for outstanding dedication and service to Lionism. Over the past four decades the Cumberland Lions Club has raised and donated in excess of $500,000 to the major charities as well as Lions Club causes like Sight First and Leader Dogs. Fundraising has come in the form of pancake festivals, bingo, barbeques, and the organization’s Melody of Music shows. Maple Hall, the home of the club, was the community centre for the village. Today the hall is used by community groups and organizations about 150 times a year. Cumberland resident Bev Baetz is offering piano lessons for beginners, be they children or adults, using the popular Piano Adventures series. The lessons range from one-half hour to 45 minutes and are held once a week in her home. She says that adults can learn the basics fairly quickly and you can work on popular music or take the "Conservatory" route. Tell her you saw it on The Canaan Connexion! Cumberland resident offers "The Works"
Cumberland Village resident Ion Aimers is owner of The Works Gourmet Burger Bistro and for the third year in a row his company has been recognized as one of "Ottawa's 2006 Fastest Growing Companies". Westboro Village location of The Works Gourmet Burger Bistro. In an interview with the Ottawa Business Journal, Ion says: "Success for me is defined as my two children's well being, my personal happiness, and true love!! I also try not to look to far ahead or I find one can lose sight of the moment. 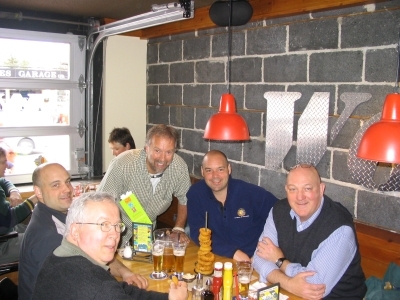 Initially everyone told me I was nuts - but I always believed that there was room for a premium gourmet burger product in the upper-end casual dining sector, set apart from the typical fast food and casual dining that permeates our restaurant landscape." You can read more on what Ion says by clicking here. Finally, there's a company in town answering the age-old question of "Where's the beef?" All you have to do is go to one of The Works Gourmet Burger Bistros and you'll find what they describe as the world's best burger. The company opened its first location in 2001 and now has three locations in Ottawa, with a fourth scheduled for the Kanata area by the fall. "We offer 434 different varieties of burgers, seven different patties and 62 different toppings," says owner and official "Big Cheese" Ion Aimers. "We really do things differently here because our meat isn't frozen, all the patties are made by made and we have some wild and wacky toppings." With burgers called Man O'War, Pesto Pizazz, Field of Dreams, Not So Thin Lizzy and The Sweet Ride, The Works offers something fun and adventurous for any taste. Mr. Aimers says he came up with the concept after years of finding substandard products on the market. "I was fed-up with what fast food had done to the burger," he says. "Thirty years ago you used to be able to get a hamburger at any corner restaurant that was good quality on a decent bun and really what's happened over the years is that fast food has pushed out the mom and pop quality restaurants." All three of The Works's locations have developed a loyal following who are devoted to The Works' burgers, which contain no filler, use the finest available beef and a top-secret blend of spices used for taste only. Mr. Aimers estimates that they prepare 250,000 of their all-beef patties each year and they offer a product that is unique in the Ottawa market. "I thought there was a niche for this type of market," he says. "We sound like a very male, beefy type of concept and it's not that way at all. We do cater heavily to women and we feature vegetarian burgers, low fat burgers and scrumptious toppings that are very eclectic." a membership of about seven,"
are quite enthusiastic about weaving and/or spinning. They meet Wednesday mornings, taking turns at their homes. to go to the new page. 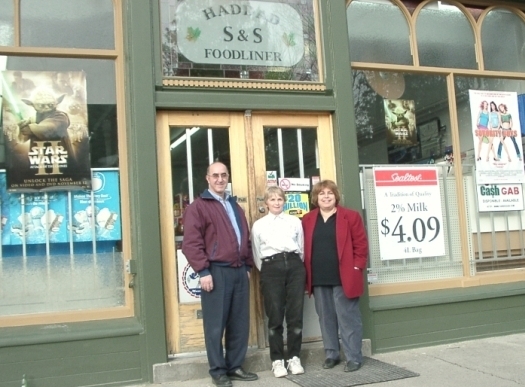 Haddad's Store ( S & S Foodliner Grocery )at 2565 Old Montreal Road, is the heart of Cumberland Village and carries just about everything that you might need in a small community, including: groceries, dairy products, some fresh produce and prepared meats, fresh-baked-on-the-premises bread, pastries and muffins, lottery tickets, newspapers and magazines, candies and pop, and a good selection of the latest movie rentals. John and Afifa Haddad with Bobbie Walker, middle. Many of the local residents drop by for a chat as they pick up their purchases, including an informal morning coffee "club". 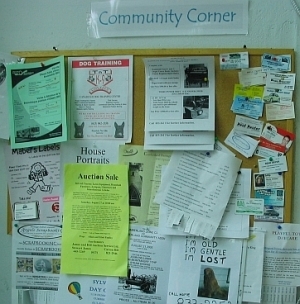 The store is also the centre for local news and information with a very active bulletin board and all of the latest newsletters, notices and occasional petitions that affect the community around it. You can leave your notice on the bulletinboard, and you can always send an item to the Canaan Connexion! In this photo the storefront is getting a facelift, thanks to local craftsman, David Hanson. The S & S Foodliner Grocery store dates back to around 1850 and has not had any substantial renovations for at least 50 years, according to David. "I grew up here," says David whose talent includes stonework, sign lettering,home maintenance, repairs and renovation. There is also a family connection. The store was owned at one time by the Dunning family (Dunning Road). "My mother (is) a Dunning," says David. Roberta "Bobbie" Walker has been part of the Haddad "family" for 15 years and finds that the best part of the job is the customers. Afifa Haddad is pointing to one of the original doors in the heritage store. At one time it connected the store to the house next door. The old door lock has the name "Peterboro" on it. NOTE: This is "archival" information. Click here to go to the new page. 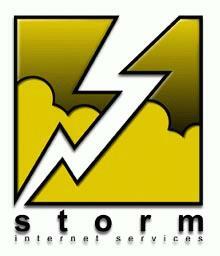 Thanks to Storm Internet Service for their support.